Have you been tuning in to the Richmond Falcon Cam and wondered where are the falcons? Since launching the cam, we have observed the male falcon on camera most days, but only briefly. He has been maintaining the nest box scrape (shallow depression made for a nest) on most visits. However, the female has not been around much and when she has, she has shown little interest in the nest box – she was last observed on camera March 8th for a brief moment while she perched on the ledge parapet. DGIF biologists headed to downtown Richmond today to investigate the situation. The biologists observed the Richmond falcon pair at the Dominion Building, which is located a few blocks from the nest cam at the Riverfront Plaza Building. 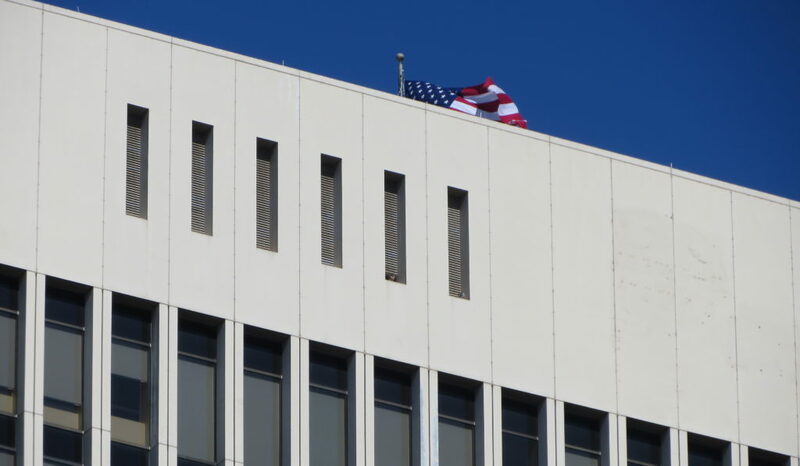 The pair was spotted perched on the louvers (long vertical ventilation slots) along the Dominion Building’s side. The base of one of the louvers opens up to a nest box just inside the Building. The Richmond pair last utilized this nest box back in 2013. They laid a clutch of five eggs there, but when they did not hatch, the pair moved to the Riverfront Plaza nest box and renested (laid a new clutch of eggs) there. Today, the DGIF biologists had the opportunity to peer into the nest box from inside the Dominion Building where they observed a scrape in the box’s gravel. There were no eggs in this scrape, but the female was perched directly in front of this nest box on the louver ledge. 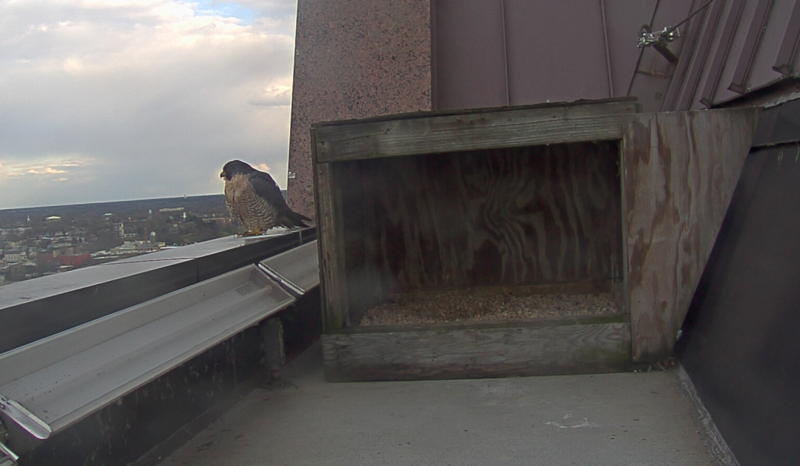 The pair’s recent lack of activity in front of the Falcon Cam at the Riverfront Plaza Building could potentially be explained by their apparent interest in the Dominion Building nest box. Will the pair decide to nest at the Dominion Building this year? Nest site selection is ultimately the female falcon’s choice. Today’s observations suggest she may be more interested in this site, but only time will tell. Stay tuned for more updates as this drama unfolds.